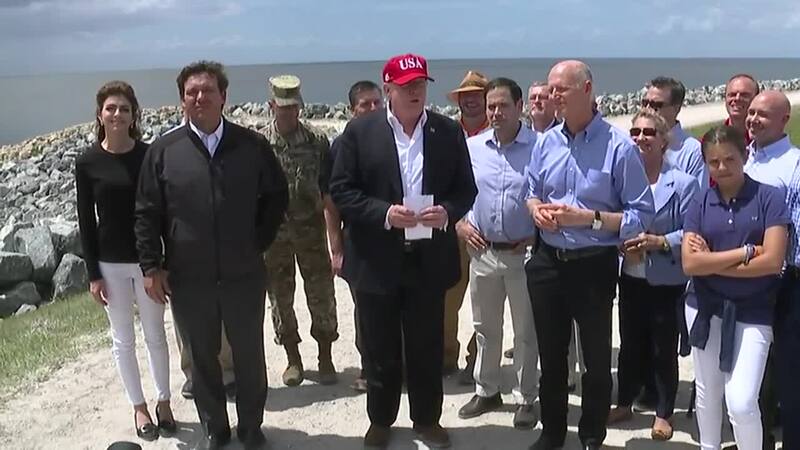 President Trump was touring Lake Okeechobee on March 29, 2019. LAKE OKEECHOBEE, Fla. — UPDATE (1:45PM): President Trump has finished touring the southern shore of Lake Okeechobee to observe progress on efforts to maintain clean water in the southern half of Florida. Trump was joined by Florida Governor Ron DeSantis, senators Marco Rubio and Rick Scott, congressmen Mario Diaz-Balart, Brian Mast, Francis Rooney, and Greg Steube, as well as representatives from the U.S. Army Corps of Engineers. Trump blasted Democrats while touting his administration's infrastructure efforts during Friday's appearance as he surveyed efforts to fortify the aging, 143-mile earthen dam. Trump claimed the dam project was "dying until we got involved." He also talked about health care, his new threat to close the U.S.-Mexico border and advertised an appearance later Friday with Small Business administrator Linda McMahon at his Palm Beach estate. A budget proposal Trump released this month includes $63 million for Everglades restoration projects, about a third of what Florida lawmakers and environmental advocates have requested. Democrats are urging the White House to add funding. We'll have more coverage on Fox 4 News at 5, 6, 10, and 11. UPDATE (12:50pm): President Trump landed in Canal Point, Florida at 12:49 p.m.
UPDATE (12:30pm): President Trump left Maro-a-Lago in Palm Beach on Marine One at 12:27 p.m., heading to Canal Point, Florida on the eastern side of Lake Okeechobee. President Trump will do a full aerial tour of Herbert Hoover Dike and Lake Okeechobee between 1:00 p.m. and 2:00 p.m. on Friday, according to senior administration officials. While there, he will speak about several key projects such as, Herbert Hoover Dike and the new reservoir at Everglades Agricultural Area. In April 2017, Rick Scott told Trump that repair of this dike was essential for Florida. The projected completion for Herbert Hoover Dike repairs is 2022. The U.S. Army Corps of Engineers is currently analyzing water levels. There is an option of raising more sections of Tamiami Trail to allow water to flow into the Everglades with half state and half federal funding totaling $144 million. Governor DeSantis, Rick Scott, and Marcio Rubio along with others will be in attendance.